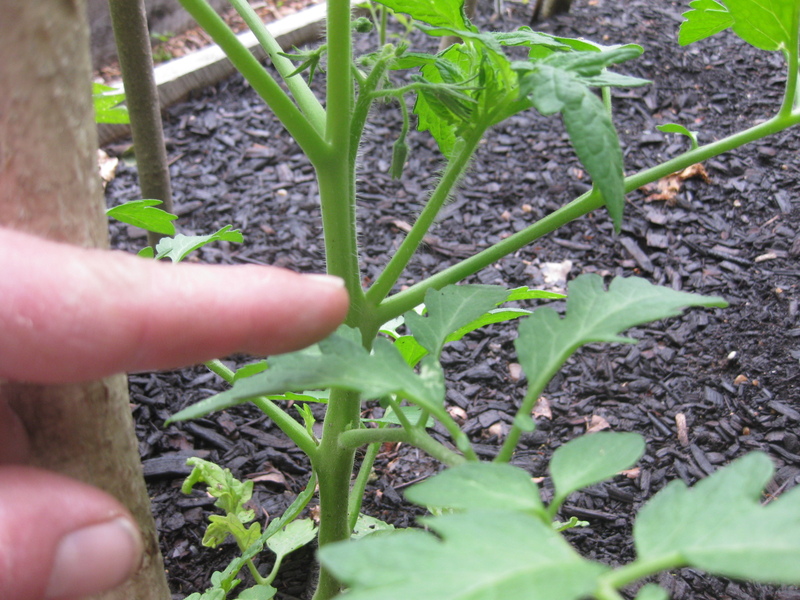 You can always spot a sucker on a tomato vine, because it grows between the axil, or crotch, of a stem and a branch. In the photo up top, I’m pointing to a soon-to-be-severed sucker on one of my twelve plants. To remove a small growth like this one, I simply bend it from side-to-side until it breaks free. I use pruning shears to remove large shoots. Did you know that suckers can have lives of their own? Just stick the stems in soil. You’d be amazed at how quickly they form roots, and become new, fruiting vines. Now, you don’t have to remove the suckers from your vines. But left to their own devices, I can tell you that tomato plants soon grow an enormous quantity of stems, require vast amounts of space and endless tying, are susceptible to disease, and produce low-quality fruit. However, a well-pruned vine, one whose leaves are all exposed to the sun, invites both health and jumbo-size produce. And such a vine can be easily maintained in small, 12-to-18-inch quarters. 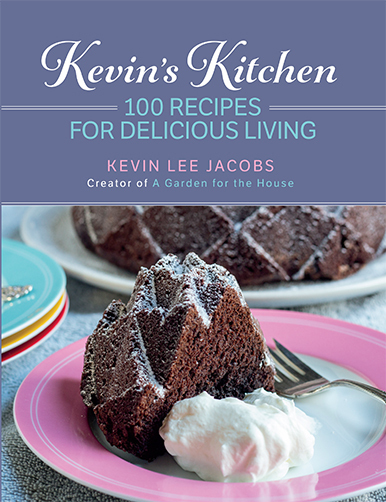 Don’t miss anything at A Garden for the House…sign up for Kevin’s weekly newsletter. Kevin, I'm going to go out today and prune off those suckers. We've had so much rain here lately, and the last thing I need is a repeat of last summer's tomato blight. Thanks for the tip/warning. Help! We've had lots and lots of gray, rainy days here, and now some of my tomato leaves are turning yellow. The plants are really bushy, and in wire cages. Should I thin out some of the vines? I don't know if I can find all of the suckers. Adele – yes, thin out the plants. You want all leaves to receive sunlight — whenever it appears! Thanks for the rain soaked tour!!! !Your garden in beautiful soaking wet!!! Did anyone else show up after the downpour? Erin – What dreadful weather on tour-day! Besides you, nine other INTREPID gardeners stopped by. And I'm so glad. It just goes to show what amazing gardens you have! I really hope the sun comes out soon. My plants are soggy…. Erin – If only Nature would provide a good, thorough soaking once a week, and sunshine the rest, how much easier our gardening lives would be! I just tamed my tomato plants this evening…it always pains me to do it, but you're right – I should stick the leftover stalks in the ground! I know its better for the plant in the long run, but its hard to shake the idea that I'm somehow “wasting” part of the plant. Your plants look fantastic so far, by the way! Kate – welcome. What a lovely blog you have! It's easy to feel guilty when pruning tomato vines. But plants — like well-trained pets — get along so much better with their owners afterward. You can also stick the stems of cuttings in water and they will form new roots, just like basil plants! Thanks for the graphic description of where, exactly, the sucker is. I usually have a quick understanding of plant-related things, but I've never been able to figure that out lol. I also prune the suckers off my tomatoes. It opens up the vines and lets more air flow and sun in. I did this last year, and my tomatoes were the size of softballs not to mention the huge quantity that was produced. It also helps prevent powdery mildew and blight. I highly recommend doing this. Your pictures are the best ones that I’ve seen for pruning tomatoes. You show very clearly how to identify the suckers. Most tutorials that I have come across are kind of vague and it took me a while to figure it out. I didn’t know about planting the suckers for more vines. What a great tip. Thanks. See, I’m with you on this! I like to keep my tomato plants nicely trimmed for my own sake! And I made the mistake of planting suckers one year… hahhaa! I never had so many tomato plants! Now because of the whole possible-hosting-of-a-fungus-thing – do you compost the suckers/extra leaves, or do you throw em’ out? Was helping my dad in his greenhouse clear all his suckers. I may be strange but i love the scent of tomato plants in a hot greenhouse when you are up close to them! Margot – I’m almost envious of you in Australia who are just heading into winter! Rosemeri – So glad you found the pictures useful. Donna B. – I usually root a few suckers, but compost the rest. Mark and Gaz – Not strange at all. To me, the scent of tomato foliage is the scent of summer! I’ve been trying to save my tomato suckers and they just die. I’ve tried planting them in soil, setting them in a pop bottle of water, with cut flower food and without. I’ve tried big ones and little ones, none have survived. What gives? Abe – Not sure why your severed suckers are not rooting. Try cutting the stems — 4-6 inches in length — early in the morning, when plants are more likely to be turgid (filled with water). Bury the entire stem so that only the leaves are above ground. Then water the soil well, and keep it watered. If the sucker wilts, spritz it with water twice a day for 2-3 days. In which region do you live? I only ask because if it is very hot where you are, you’ll probably have better rooting-success if you plant the suckers where they are protected from direct sun. Have you ever heard of making insecticide with your tomato trimmings? I just read in an newspaper article that featured a gardener who does this but it didn’t go into details. It was the first i’d ever heard of it. I would love to see a shot from further back to see how your support structure looks for the tomatoes. Are those branches? I wholeheartedly agree with the pruning. Not only for tomatoes but for many other fruits as well. The need it to produce exceptional fruit otherwise the plant produces squat to eat. The other reason to remove those suckers is that as soon as they start growing, the plant almost immediately starts to bend the branch the sucker is next to down, which also adds to the leafy congestion lower down. Another good thing to do with tomatoes to reduce fungal diseases is to trim off the lower branches so light and air gets inside the bottom foot or so of the plant, which is typically where these diseases start. I trim off every branch that comes within an inch or so of touching the ground. 🙂 Thanks Kevin for answering my question! I will check out my plants and replant those suckers! Those little suckers do have a life of their own. My Father will root them and then have late blooming tomatoes for end of, end of season fruit! Hi, Do you take the suckers from determinate and indeterminate tomato plants? I went out to cut the suckers off all my plants and probably didn’t do it right. Your picture was helpful but it was very bushy around the bottom of the plants that I couldn’t see well enough. So I just thinned out branches that didn’t have any tomatoes or buds. This is the first successful year I’ve had in a very long time with my plants and I have tons of Roma tomatoes growing! Also, I found a very cheap way to fertilize – Epsom Salt. One question, and I read this a few years ago but want to get verification. I don’t want to use any pesticides on my garden. I read that just a soap and water mixture is good for keeping bugs off, but what would be the ratio? Thanks for all your helpful tips! I only de-sucker determinate tomatoes. Most of the heirlooms are indeterminate and I don’t de-sucker those. I keep the plants free of suckers until the first true branching of the main stem, then I leave the suckers until the first fruits start to ripen. After that I only take off the suckers to manage the size of the plants. Indeterminates, by their nature, keep growing and producing until fall when the daylight hours are less than 9 or 10 a day. I use the stackable tomato cages from Gardeners Supply. I stack 3 ft cages two high, and my vines are always way over the 6 foot level, with huge fruits. Please note that if you grow determinate tomatoes you must de-sucker the vines. Not so with indeterminates. Thank you, I knew there was a method /’ system for pruning and trimming tomato plants to ensure healthy abundant fruit but didn’t know the precise details. I’m about to pot some starter plants and I’ll be sure to trim the suckers. I am new to gardening, to some this will be a silly question, what is the difference between indeterminates & determinate? I will be planting my first vegi garden this yr. I have a raised garden bed filled with composted dirt. trying learn as many tips & tricks as I can! Deanna – Determinate, or “bush” tomatoes grow on compact plants (about 4 ft). The plant stops growing after the fruit has set, and once the fruit has ripened, the plant dies. The benefit of determinate tomatoes is that all the fruit ripens at about the same time. Indeterminate tomatoes (which is what I have) are like weeds — they keep growing and growing, usually maxing out at 10 feet. The benefit of indeterminate tomatoes is that the plants produce flowers and fruit continuously over a long season. The plants do not die until they are nipped by the first hard frost. When living in Austin we had only a few freezes during winter months. I would take suckers from my favorite plants, tend them in the kitchen window and replant them in late January giving me very early, wonderful crops. Doesn’t work in Albuquerque w/o a greenhouse as our winters are too long and suckers get leggy and pale. The kids were great help and I love the time that they spend in the garden. How do you secure your plants to so that they do not topple over with fruit? We have some tomato cages, but not enough for all of our plants. Thanks! Amy – Looks like your kids were having fun! And.. stay tuned for this summer’s tomato-trellis model! Thank you for the information about how to get my suckers to survive. So what is “tickling”? I never heard of it before. How do you tickle tomato plants. Learn something everyday, when I get home from work, I will be lucking for those suckers. I am also going to stick them in water like you say, and hopefully I can turn them from suckers to productive tomato plants. Am I wrong thinking suckers should only be removed from indeterminate tomatoes? 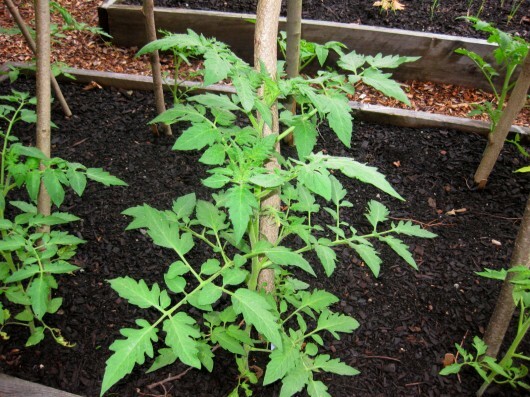 Determinate type tomatoes don’t really require any pruning at all. Determinate tomatoes tend to be more compact. They reach a certain height and then stop growing. They don’t usually set their fruit until the branches are pretty much fully grown and then they set their fruit all at once. Since no new fruit will be developing after pruning, nothing is gained by pruning. 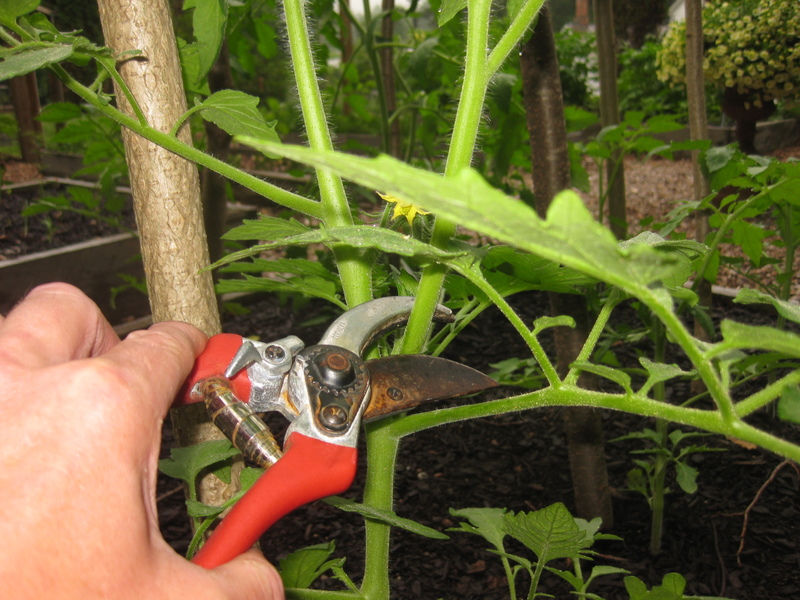 Since indeterminate tomato plants can get extremely large and will keep producing tomatoes all season, they can handle some pruning. If you leave all the suckers to grow, your plants will become heavy and out of control. On the other hand, removing all the suckers will result in a more compact plant, but it will also lessen your tomato yield. 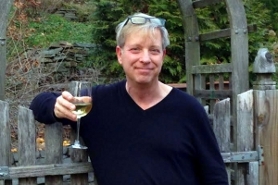 Thanks Kevin for your blog. I really enjoy reading about the tomato desuckering, scape pesto, the gorgeous kale quiche and looking at your garden picture. I use many of your ideas such as newspaper mulch and using uncolored wood chipping natural mulch. Thanks for sharing! cmkrause – Sorry for the delayed response! Yes, I’m referringto intederminate tomatoes– the kind that grow and grow, and produce tomatoes up until frost. Janet – So glad you enjoy this site. Thank you for reading it! my first year with a greenhouse and my tomatoes are doing great. and have started 6 tomato plants from suckers. going to try growing the cherry tomato indoors. figured can’t hurt and am out nothing. freezing whole tomatoes works great when you have more than you can deal with at a time which sometimes happens here where i live because we sometimes lose our first planting to frost-of course have found out since that if you cut the plant back it witll just grow again–hence the too many tomatoes and new greenhouse. love the info on your site. thanks for telling me about the suckers. Thank you, I am always nervous to thin and prune but it must be done. We live in WY and certainly don’t have a problem with grey, rainy days!! Growing up we never trimmed our plants and they always did great. Here where the growing season is shorter, we have a problem with the tomatoes not ripening fast enough. I had a dozen plants loaded with huge green tomatoes and then we got our first frost. We had nothing to cover the plants with so they all froze. Some of my friends picked theirs green but i wasn’t sure if they’d ripen. So this year i’ll have to try trimming the suckers and see if it helps any. Can you tell me if this also works on dwarf Lemon trees and flowering plants such as Dahlias? To LeDena above….I have pruned early small branches off my Dahlias and gotten them to root in a propagation tray with a water reservoir below the tray of cells. Of course it’s a perfect match for the parent plant. I plan to try using the tomato suckers the same way, aiming to help a friend who lost most of his tomato plants to a surprise late frost. This idea is perfectly timed for me. Thanks Kevin! I got my first ripe tomato today. I know tomatoes and tomatillos are not the same, but the plants seem to grow the same. Should I de-sucker my tomatillos as well? I always plucked the suckers just because Grandma did. Thanks for telling me why!! But the determinate and indeterminate rocked my boat. How do I know which is which when I am buying seeds or plants? You always have the best info! I, like Ann Marie B, am looking for some help with my tomatillos. Any information regarding sucker plucking on my tomatillo plants would be very helpful. Hi george goetz – Congratulations on your first ripe tomato! Hi Ann Marie B. and Mary I – Yes, tomatillos are pruned exactly like tomatoes. For the best tomatillo-harvest, you’ll want just two main central stems. Hi Betty Blalock – Seed packets and seed catalogues usually indicate whether the tomatoes are determiniate or not. If no indication is listed, assume indeterminate. I have about 4 large plants. 2 are Heirloom, I have cut off lots of what I think are suckers. Now they look like I have given them a short haircut. Can you take too many leaves off?Mine look like trees. I noticed my suckers had flowers and the branch they were ‘over’ didn’t. On one plant I did an expire net. I pruned the lower branches and left the suckers to grow and develop. They produced plenty of tomatoes and the bonus was that they were straight up and easier to stake. Thanks so much for sharing this great tip! I’m a new gardener, and I just added tomatoes to my garden this year. I’m hoping for some big ones! I have never tried to root the suckers before, but I think I will this time. A gardener friend told me I should never put tomato suckers into my compost (I always have before!) He said if there were any diseases or fungi, they could contaminate the whole compost heap. Live and learn! This was a great post Kevin! I have a grape tomato plant that is very out of control, now I know how to trim it back! Thanks! great repost, timely advice. i was vigilant about suckers, and left for a week and OH MY, some of the suckers were over 6″ long in that time. Back under control now. Hoping to keep the blight at bay with air circulation and blight resistant types…although i always have to try some new kinds… Parks Whopper seems to be the only one starting with septoria leaf spot…so it will be off the list next year. Here in Bulgaria they are called little brothers, or malki brat, and this is where I learned to de sucker my tomato plants. This year I am growing American heirloom tomatoes and they are doing beautifully! As Paula K says – a timely reminder. I don’t feel so bad pinching them off when they’re tiny, but when I let them get out of control and those suckers start flowering, I feel kind of bad cutting them off. I didn’t know you could plant them. They will have to end up in the compost, though, as there’s no room to put them. Thank you again for the great lesson with pics. I have been a gardener for a long time and I have read about pruning but I could not figure out what to prune. I really need your visual aids. Can you trim the tops of the tomato plants to make them bushier? Thnks, I will take care of this today. Very helpful! Thnx! Another support method is to buy a rigid fence panel, 8′ x 6′, and cut it into two 4 x 6 pieces with a bolt cutter. Fasten two of the short sides together with wire (I used leftover promotional key rings and they worked great!) Push the opposite ends well into the ground at either edge of your bed, and viola! The holes in the fence fabric are about 4″ x 4″, good for weaving or tying vines. Then at the end of the season fold the two sides together for storing against a wall or a fence. Mine are in their sixth season, still going strong. Kevin, if you think you’re tomatoes are “indeterminate”, you should see what I’ve got growing in the fallow bed of last years garden! I was too ill this spring to do anything, so have just been keeping it mowed between the tansy and marigolds I plant for insect control. The other day, while out mowing, I noticed a cuke vine in amongst the tansy……today, 3 tomato vines I didn’t plant! Hi, do you know how I can get rid of woodbugs in my garden? They always crawl around my tomato plant and eat the leaves, but I don’t want to use any chemicals on my plant. What can I do? This is the first time I’ve used the topsy turvy for my tomato plants …I’ve heard good and bad…the dirt seems to stay wet after all the rain …can this be ok ???? Hi Sera – Maybe this post from GardensAlive will help you. Hi Ruth – I have zero experience with the Topsy Turvy growing-method. Sorry I can’t help you! I set some good tomatoes but now all the flowers are dropping. No new tomatoes. What am I doing wrong? this is the first year I have focused well on the suckers – always try to take them out but this year I have 40 plants closely planted in very fertile organic soil. they have clusters of Striped Romans happily hanging from the well supported strong plants. All from saved seeds of one tomato….heirlooms, delicious. thanks Kevin for the timely reminder! I just de-suckered my tomatoes this past weekend, and had no idea you could root the cuttings. Something to try to remember for next year! I find de-suckering the plants really helps in a few weeks, when I’ll need to keep an eye out for the horrible tomato hornworm. Evil creature that it is – the more it eats, the more it matches the color of the plants. And it can strip my garden in a day or two. Out here in the high desert of SoCal, we don’t remove suckers. We want every leaf covering the plant. Between sun scald on the tomatoes and the wind desiccating the leaves, it is hard to get any fruit during July. Some day we might live in a climate with less wind and <100 degrees. In the meantime, I can enjoy your garden through the internet. Thanks. Suckers are really prolific this wet rainy season in PA. Pinching and cutting them nearly every day. A few got quite big coming up from hearly the base. Some sort of blight is already starting — Honey Delight the worst so far. Even the always reliable Sun Gold has blighted leaves at the bottom. We trim those off too. Scary to take a full trug of tomato leaves out of the garden regulary…but hoping it helps contain the problem. Anyone have any other solutions? My tomato plants are already suffering from leaves turning brown and dropping off. Is there any way to stop this? We have had an unusually wet May and June here in N.Illinois. Thank you for the reminder..I always forget to do this….off to the garden! If you are going for large fruit (I prefer 1 serving sized fruit, or bite sized in the case of the small tomatoes) you will need a way to support the weight. If the tomatoes are in a cage you have a hard time getting at them to pick or to prune, and if they are coming up a pole the heavy tomatoes can break their stems or the stem of the whole cluster. Putting a wire fence, with 2X4 inch squares, down the row with a pole at each end and at 4 to 6 foot intervals between alternate plants lets you weave the vine through the mesh. You can pick from both sides of the fence and the supports do not shade the plants. If you are not going for jumbo fruit you can let more stems grow. In the PNW we have summer drought. It is best to prune out most of the leaves late in the season to improve air circulation when rain is threatening. Up till that time they keep the sun from scalding the fruit. It is always good to prune out leaves and stems that clutter up the plant too much and certainly to remove any leaves that touch the ground. To prevent a jungle and have a lot of fruit you can pinch the tips of most side branches above the last flower buds to stop them from getting any longer. Hi Keven, I never thought about de-suckering but it makes perfect sense. I just recently worked over my 8 cages with 14 tomato plants. I removed thick lower foliage to encourage good air circulation. I removed only a few suckers because I have noticed fruits with sunscald in the past when a lot of foliage was gone. It’s always easier to remove the suckers when they are small and can be bent sideways with fingers, not even needing pruners. Tricky, though, to not tear a strip down the stem. Yellowing and spotty branches are just appearing here and go faster some years than others. We have had 5 weeks of frequent rainfall and I am expecting a problem. In the past, I was still able to harvest a considerable amount of fruit despite the loss of foliage. I am limited in my ability to rotate the positions of the tomatoes from season to season, although I do try. Each year I like to grow a new tomato and this year it’s Goldilox, a dwarf yellow tomato. My steady favorites are: Red Calabash (Mexican Heirloom), Yugoslavian Heirloom, St. Pierre (classic French Market tomato) and Jaune Flamme, a round orange beauty. I favor folding square wire cages and the enormous Texas Tomato cages, two pieces, also folding for storage. They will ripen sooner as well. Had my first tomatoes this weekend and the plants are loaded! I have always followed my grandparents, parents routine and de-suckered all my tomato plants – excellent advice. I do also tie them to keep them from breaking off when they become too heavy with fruit. YUMMMM! I’m jealous. Can’t grow these without a greenhouse but wouldn’t you know it they came up in my compost pile (store bought grape cherry) in the shade—–just to torture me with their wonderful smell! This seems contrary to the information above, that indeterminate should be trimmed down and suckers removed. This was on a gardening site; how do I come to terms with the exact opposite recommendation regarding the trimming? “Determinate tomato varieties produce the early season fruits and are generally set out earlier in the season. Determinate tomatoes are usually smaller and can be grown in containers. I steak all my tomato and pepper plants up with PVC pipe. I buy 10′ pieces and cut them to the length I think I’ll need after burying them about 1 1/2 ‘ in the soil. Then as they grow I tie them to the PVC with yarn with a couple twist around the post being careful not to tie it too tight so you don’t crush the vine. As it grows just cut more yarn and tie it higher up the pole. The pipe doesn’t take up much room either. Been doing this for years. Hi! Wonderful tip! We have always just let them grow and always end up with a HUGE mess, rotted tomatoes on the ground, etc. I want to prune, but I’m wondering if it’s too late. Our plants are quite large now (been in the ground since June 1st). Is it okay to prune the suckers when they are quite big? I see in your pictures above that you prune some large ones 🙂 Thank you! Hi Tara – Yes, you can prune suckers now. Enjoy your harvest! I have found a responsive site, that is wonderful. I started late this year, my tomato plants just got planted about 3 weeks ago. I will have to pull them in at the peak of their growing season. I will have tomatoes until January. Any tips for me? Help- My tomato plant is not growing, but there are 2 HUGE tomatoes growing from it. It seems like the fruit is sapping the life from the plant. Please advise…should I cut the fruit? In southern Arizona we don’t “prune suckers” from tomatoes. We keep all the green leafy growth we can encourage in order to support ample food production for the fruits and to shade them in our harsh spring and ear;y summer desert while they grow and ripen. Thank you, Kevin. I’ve lived in Tomato Land forever and did not know this. I always have a hardt ime finding the suckers. 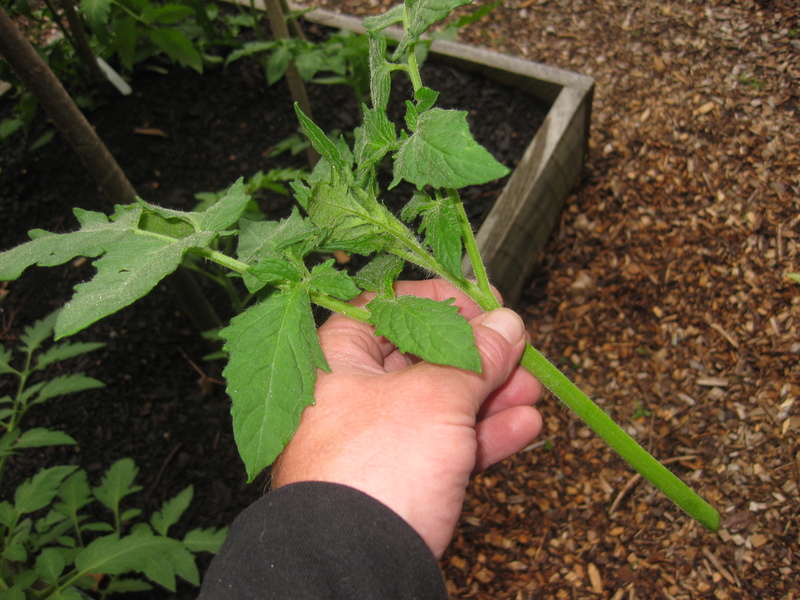 I take my tomatoes starts and bend them over and nip off the second second set of leaves. This makes my tomatoes send down more tha 1 long tap root and branch out so its a bigger more abundant producer. After they are really big I thin the plants and get rid of the parts that are branches with just leaves that are probably the suckers. Thanks! will prune my vines in the morning! Can the “suckers” be left in water like sweet potatoes and grow roots? In order to buy myself time until I can create space for them in my veggie garden. Kevin I often cannot find a place to print your instructions? Hi Jeanette – Print feature not available for my gardening articles. Sorry about that! Always de-sucker and also plant tomatoes deep with great results but am I the only one who has problems with squirrels? They do not eat the tomatoes except maybe take one tiny bite (just enough that you have to throw the tomato away) but they run up and down the plants and break so many of the branches that the plant cannot come back . Thank you Kevin for all your patience with us! My trellis is mostly string. baling string to be exact. If didn’t use it, it would be thrown out in the land fill to not deteriorate for a long time. I anchor the string with a little stake … one for each plant. However, if you let ONE of the suckers grow from the base… AND your soil is VERY RICH, you can let that sucker be another tomato vine. Basically two vines from one plant, which, of course, will need its own string. As the vine grows… wrap it around the string… not the string around the vine.